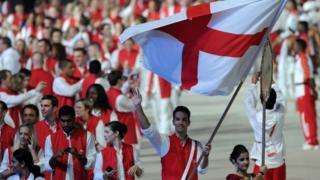 MPs have given initial support to the idea of England adopting an official national anthem. However, Chesterfield MP Toby Perkins believes England needs its own anthem and presented his case in the House of Commons as a ten minute rule motion. His English National Anthem Bill was adopted by the House. The idea will be debated again at a second reading on 4 March. The bill would bestow a responsibility on the Secretary of State for Culture, Media and Sport to hold a consultation across the UK, and Mr Perkins suggested there could even be an "X Factor style programme" to select a song. Goodbye to God Save the Queen? Mr Perkins said it "seemed incongruous" for the English to sing about Britain when their teams play against other home nations, while the Welsh and Scots sing an anthem that reflects their nation's identity. "It reflects a sense that we see Britain and England as synonymous," he said. "This not only denies us English an opportunity to celebrate the nation that is being represented but is also a cause for resentment amongst other countries within the British Isles who feel that England have requisitioned a British song." But his proposal for an English anthem was opposed by Jacob Rees-Mogg, Conservative MP for North East Somerset. "When the honourable gentleman for Chesterfield said that now English crowds take St George's flag rather than the Union Jack, to me that's a matter of pity, of shame, that we have given up viewing ourselves as one United Kingdom, whether we are supporting England, Scotland, Wales or Northern Ireland," he said. "These expressions of the individual nationalism are a disuniting factor in our country, in a country that we ought to want to make more united," he said. Mr Perkins said there had been a lot of interest in choosing an anthem when he spoke on radio stations across England. "I won't say which area it was that thought the most appropriate choice for an English national anthem should be Heaven Knows I'm Miserable Now," he said. "It will remain a secret between myself and the listeners of BBC Humberside, but it was perhaps reflective that each local area has its own sense of what Englishness means." Campaign group England In My Heart wants Jerusalem to be adopted and arranged for a van with loudspeakers to drive around Parliament playing the song ahead of the debate. "It's about time England was able to celebrate being English at sporting events," said group member Eddie Bone. "Let the Scots and the Welsh celebrate theirs and then we come together at the end and sing God Save the Queen." Another campaign group, Anthem 4 England, said Jerusalem has come out as favourite in previous polls. Member Gareth Young said it was his personal favourite too. "It's a beautiful song and it actually mentions and is about England, unlike its competitors," he said. He said people wrongly think it's a hymn and also "object to the fact that it references a Middle Eastern city" but said these objections were "largely based on ignorance" as Jerusalem was a metaphor for a better place. Using the UK anthem as the English anthem was an "unnecessary strain on relations between England and Scotland" in the wake of the independence referendum, he added. "God Save the Queen is the British anthem and should belong equally to the English, Scottish, Welsh and Northern Irish," he said. Prime Minister David Cameron has said that Jerusalem would be his choice for England's national anthem, according to the ConservativeHome website. Toby Perkins said I Vow To Thee, My Country and There'll Always Be an England were also options. Campaigners have also suggested creating an anthem from scratch. Should England sing the National Anthem?